With the aid of diligent professionals and smart packaging system, we can easily render bulk and customized packaging requirements of the patrons. Also, we ensure that the packed lot has shock sustainability to circumvent loss during transit. Since, we have a widespread supply chain network; we can satisfy buyers by catering to bulk requirements and making delivery within the stipulated time. 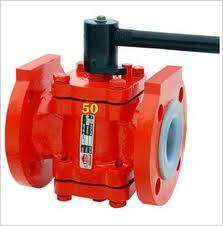 Meet design specification as per B 16.34 / Flange dimensions as per B 16.5. Leakage Class - as per Class VI shut off. Applications Industrial Organic Chemicals,Detergent production,Alkali’s & Chlorine,Bromine Production etc. Features Lining Standard as per ASTM F 1545,Flow characteristics for control application etc.